Malcolm Gladwell’s first book, The Tipping Point is probably his most well known book (you can read my review here). Blink, his second book, is less well known but it’s also a very interesting read (review here). I enjoyed both books enormously so I was quite excited to hear that he had a new one out. Some clever person gave me Outliers for my birthday and I’ve just finished it. As with his other books, it was a very interesting read. Malcolm Gladwell has a captivating writing style. He shares descriptions and facts which seem irrelevant to the story, but which add depth and colour to a book which is essentially a look at historical facts and statistics. Weaving statistics and the results of scientific studies into stories of real people, he brings what could be dry text book material to life. But more than that he takes these scientific studies and linking them together, he constructs a convincing case for his proposition. 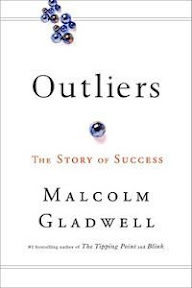 The proposition of ‘Outliers: The story of success’ is that while successful people are talented in their field and they have taken opportunities offered to them, they are not successful just because of that. The book very convinvingly shows that success is a product of many things including when one is born, where one is born and even where one’s ancestors come from. He looks at Bill Gates, professional ice hockey players, airline pilots and Chines farmers, amongst others. He shows how in each of these very different fields, there are many factors which affect the success of an individual. The point is not to say that successful people have no responsibility in creating their success, but rather that if circumstances were different, there would be a lot more successful people in the world. As with Blink, reading Outliers will change the way you look at people whether they are successful or not. It will help you to realise that people act and think in certain ways for a multitude of reasons, which could be as obtuse as where their ancestors are from. A highly recommended read.